If you are planning a luxurious staycation right in the city centre with easy access to shopping and food at Orchard Road, then Shangri-La, Singapore Hotel The Valley Wing is one of the staycation options you can consider which offers personalised check-in procedure in a private lobby, personalised butler services, complimentary unlimited serving of wines, champagne and canapes at the Champagne Bar throughout the day! 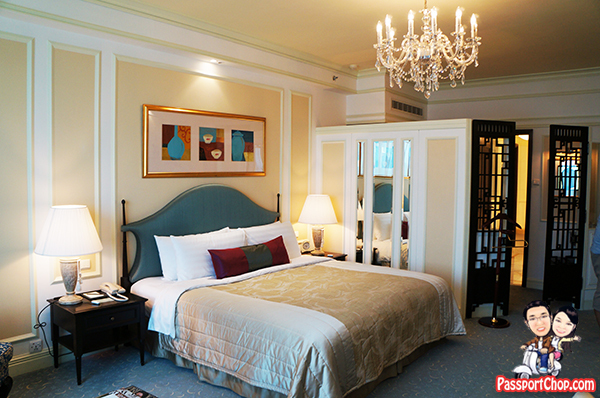 The published rates (in SGD) for the Shangri-La, Singapore Valley Wing rooms start at $875 per night (for the Deluxe Rooms). The Deluxe Rooms come with either city or pool views and each averages an area of 57 square metres and is furnished with the finest quality fabrics, including Italian made-to-measure pure Egyptian cotton bed linen and specially handpicked imported fabrics for its upholstery. This is a place where fluff does matter! 🙂 Every part of the room is designed to ensure you sleep well from the Simmons Beautyrest mattress to selection of pillows from the specialised Pillow Menu and the finest bed linen!. If you are a regular guests of The Valley Wing, you could also be presented with your personalised pillowcases and bathrobes with your initials embroidered! The Valley Wing is an exclusive wing that is separate from the rest of the hotel. It has its own private entrance and driveway and reception area. 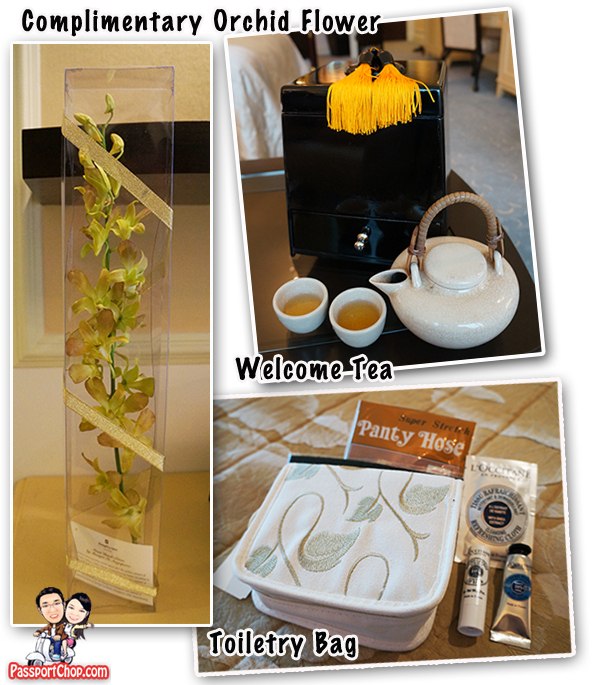 Upon arrival at the Shangri-La Hotel, Singapore Valley Wing, each guest is warmly received by a Guest Relations Officer, and is personally presented with welcome gifts unique to the Valley Wing by the Valley Wing Manager, including a cuddly Valley Wing teddy bear for children and exotic orchids for the ladies (Sorry – none for the gentleman 🙁 – they can help themselves to in-room welcome tea presented in an elegant tea box). The Valley Wing bathrooms are very spacious with elegant floor-to-wall marble and come with a complete range of luxury bath products. Guests can enjoy a choice of mood lighting in relaxing or bright settings, an LCD television unit facing the bathtub and a tropical rain showerhead fitting. 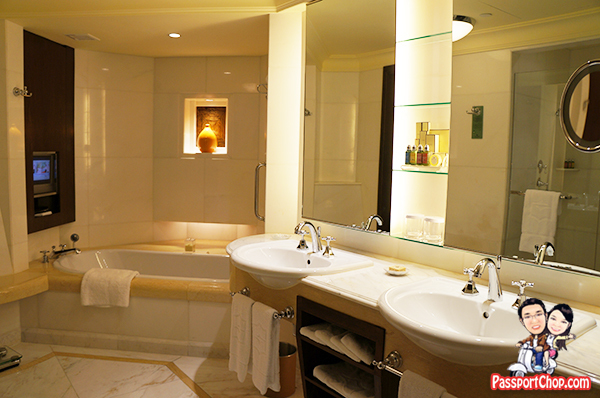 There is also an in-room Bath Menu where guests can choose from 3 specialty baths – for the gentleman or lady or just a rejuvenating salt bath which will be drawn personally by the butler (at a cost). There is also a complimentary toiletries bag with lipbalm, pantyhose, headband and moisturiser for the ladies. The Valley Wing lobby is one of the most impressive hotel lobby I have seen – it stands at an impressive 10 metres high with exquisite crystal chandeliers hanging from the ceiling, providing a grand sense of arrival at The Valley Wing. The visual impact of the lobby, with its fine Italian marble floor, is one of understated elegance and quiet grandeur, with a touch of oriental influence. If you like art, you can also check out the carefully selected art pieces displayed at The Valley Wing lobby. One thing that probably caught your attention at the first paragraph of this article had to be complimentary unlimited serving of wines, champagne and canapes at the Champagne Bar! Any hotel that offers unlimited and free flowing champagne to its guests throughout the day is my kind of place. 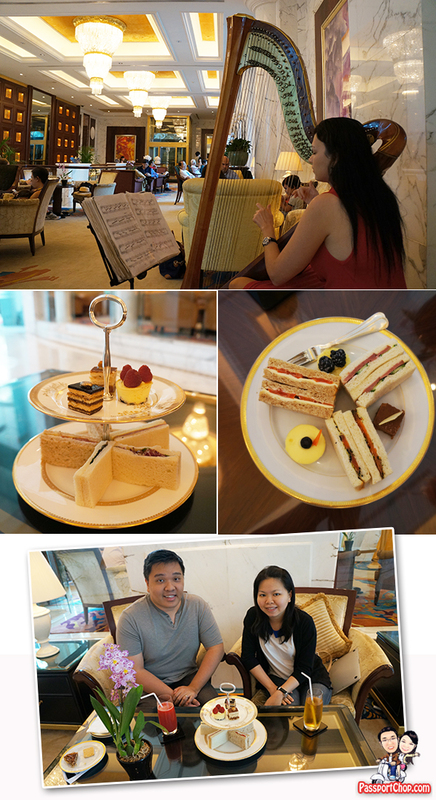 Furthermore, there’s complimentary afternoon tea with scones, cakes and sandwiches – all served at The Valley Wing lobby! With its unique ambience, combined with personalised services and exclusive facilities at the Shangri-La Hotel Valley Wing, it is not surprising that this exclusive sanctuary had remained one of the most luxurious and exclusive accommodation of choice in the region for royalty, heads of state, foreign dignitaries whenever they visit Singapore. Despite The Valley Wing’s luxurious experience, “normal non-royalty” people like us will not feel out of place here. Regardless of who you are, as long as you are a guest at The Valley Wing, you will still get the same level of great service. 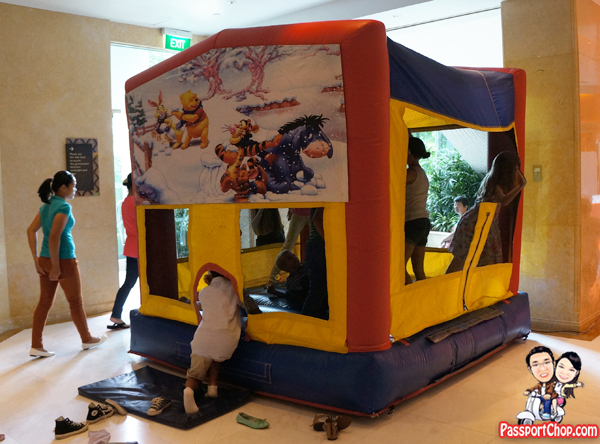 For families, a staycation at Shangri-La Hotel – be it Garden Wing, Tower Wing or Valley Wing – is a lot more fun whenever Shangri-La Hotel, Singapore delivers an enchanting line-up of festivities and goodies to delight guests during major public holidays e.g. Easter, Christmas. We were at the Shangri-La Hotel over the recent Easter break where there was an Easter egg hunt and a number of fringe activities (mainly for the kids) e.g. this bouncing castle in the picture below. 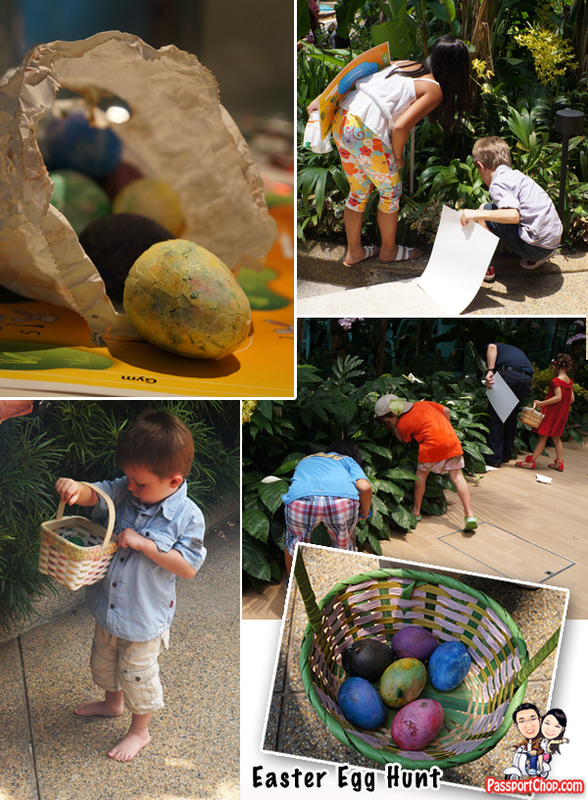 The highlight of the Shangri-La, Singapore’s Easter activties had to be the annual Easter Egg Hunt conducted around 1pm. All junior hunters were briefed on their “mission i.e. 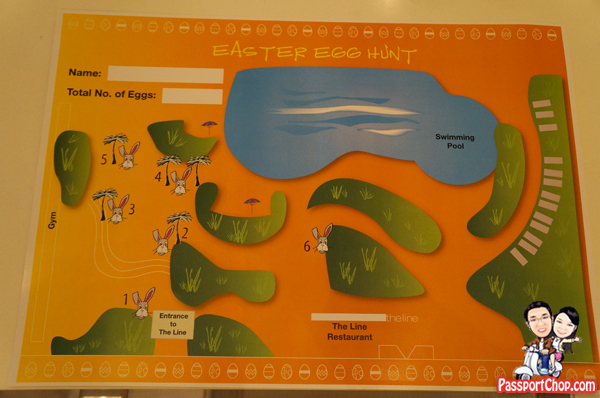 to collect as many Easter Eggs as possible around the Shangri-La gardens – a map was provided to each of them with an indicative location of where these eggs could possibly be. You will be surprised at how many kids are involved in this – I estimated as many as 30-40 of them! When the signal for the start of the Shangri-La Singapore Easter Egg hunt was given, fun chaos and madness prevailed as both the kids and (not a big surprise there) kiasu parents (both Singaporeans and foreigners) rush to the gardens, sweeping every bush and grass in search of the “painted hard-boiled eggs” (which are known as Easter eggs to the participants). 🙂 The search area was confined to a very small area between the entrance to the Line (from the ground floor) to the entrance to the Waterfall Cafe so I think there were minimal disturbances to the guests in their rooms. Within 15-20 minutes, the search for the Easter Eggs had ended and the kids were all gathered back around The Line Shop (some with a basketful of eggs!). 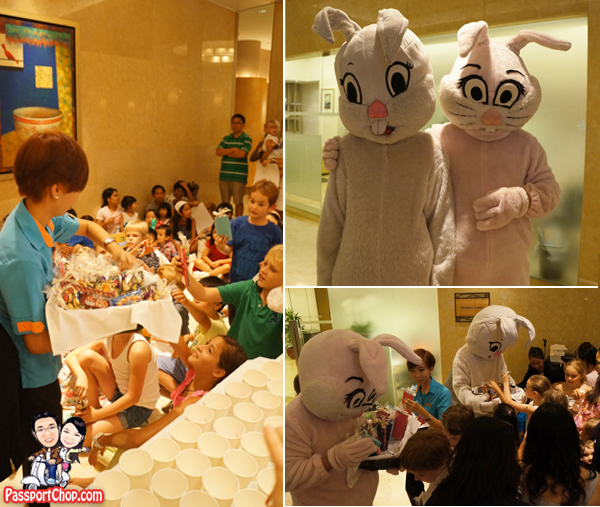 The best part of this Easter Egg Hunt activity was that the Shangri-La, Singapore organisers ensured that every junior egg hunter was a winner by distributing free goodies – sweets and chocolates to every participating child. There was no “one” winner – all were winners regardless of the number of eggs they collected! For the adults, they can enjoy Easter Sunday with brunch buffets at The Line, The Rose Veranda and Waterfall Cafe (they will have to pay for it :-)) The Line’s Easter Sunday brunch buffet included angelic eggs, Cumberland sausages in rosemary breadcrumbs, and yam nest with fried mozzarella stuffed risotto balls. 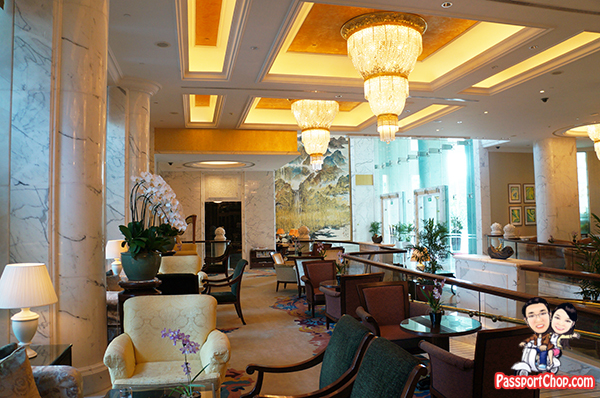 Shangri-La Hotel Singapore is located just minutes from the busy Orchard shopping belt. Getting there is easy – you can either walk from the Tower Wing entrance (for about 5-8 minutes til you reach Tanglin Road) or take a taxi or take the free Shangri-La shuttle buses. The scheduled shuttle bus services are very on-time right to the minute (get the timetable from the concierge) and they bring you to many of the hottest shopping areas along Orchard Road e.g. Takashimaya, Ion Orchard and you can also drop off at the Orchard MRT station to expand your shopping areas! For corporate travellers, the Shangri-La Hotel offers shuttle services to Science Park, Vivocity, Orchard MRT and other areas in the morning – there are multiple routes to different areas. Do take note that the shuttle buses depart from the Tower Wing entrance – just 3-5 minutes from the Valley Wing lobby via a sheltered walkway. All guests flying into the Singapore Changi Airport are greeted by the friendly Airport Concierge and then chauffeur-driven in the Mercedes limousines to The Valley Wing. During the car journey, guests can relax with a cool bottle of mineral water and catch up with world affairs from a wide selection of international papers or simply unwind to music from a choice of CDs.